At this time, we are only accepting volunteer groups (not individual walkins). All groups must be scheduled and approved before arriving. Please contact Jenise Carr at farmmanager@sweetwater-organic.org to schedule your group volunteer day. 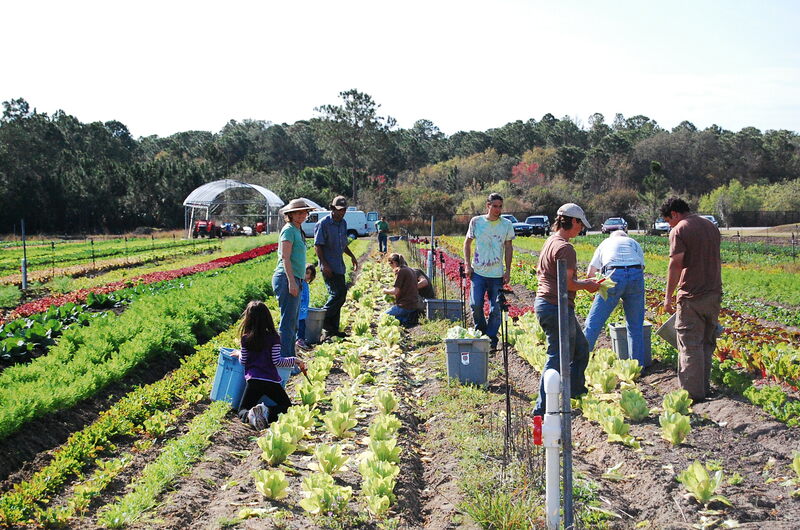 Volunteers can assist with a variety of farm tasks such as planting, harvesting, and weeding. (See a typical farm task schedule below.) There are also site projects for those with carpentry and electrical skills. Or if you just enjoy cooking, cleaning, photography, painting, sewing, teaching, or any other past time let’s talk about how you can help! As a CSA Member, we ask that you volunteer 4 hours (per membership) each season so that you can become better connected with our Community. We rely on this help to keep the costs of membership down. However, we understand that not everyone has the time or ability to help out. If you would like to “opt out” of your volunteer hours, you may do so by paying a $30 fee anytime during the season. All volunteers are required to wear close-toed shoes. Bring anything you’ll need for working outdoors (hat, gloves, etc.). Please apply any sunscreen or bug spray before you reach the farm. Bring PLENTY OF WATER to drink! You may also bring food to eat at our picnic tables. We have a refrigerator and microwave for volunteer and staff use. Please DO NOT bring valuables to the farm. We do not offer a place to lock up your things. There is a locker where you may keep things like car keys or non-valuable items. Things left in this office are at your own risk. What time should I arrive to volunteer? Our farmers start their day at 7:30 am. Please meet them in the main barn at that time so that you can be part of the morning meeting to determine what projects will be worked on and who will be doing what. We have another farm at The Children’s Home off of Memorial Highway where the farmers often go after their meeting. If you are not able to be there at 7:30, you may miss them. So please contact us if you plan to arrive at a later time so we can discuss how to coordinate with you. Where do I park as a volunteer? Volunteers should park off of Hanley/Comanche. Please do not park in the designated handicapped parking lot, or on the east side of Comanche Avenue in front of the property or our neighbors houses. (You may get towed.) There is no parking allowed inside the gates on Sweetwater property. What if I get to the farm and the gate is closed? If you reach the farm and the gate is closed, it may be because you are a little early or a little late to meet the farmers at 7:30 am. If you are on time, it may be that only one of the two entrances has been opened. (There is a gate entrance on the north side of the property on Comanche Avenue and a gate on the south side of the property on Mohawk Avenue.) Drive to the other entrance to see if it is open. If both entrances are locked wait for another 5 minutes to see if anyone shows up. Try calling the farm office to see if anyone answers 813-887-4066. If all else fails, it probably means we got our wires crossed and you are at the farm when we are closed. Or it may mean that you missed us and will need to try again another day. Keep in mind, we do our best to work with our volunteers, but we are a working farm and cannot always accommodate everyone’s schedules. Can children volunteer at your farm? Another option for younger kids is to come out on a Thursday or Sunday morning about 10:00-10:30 am and wash the veggies that are harvested from the fields. The kids usually love to help with this and if they get bored, there is plenty of room to run around a bit or dig in the dirt. 16+ may volunteer without an adult. We ask that you have your own transportation the day you volunteer. We have two farm sites that are 4 miles away from one another that we regularly work and may need volunteers to go to one site or the other based on the day’s activities, weather, number of volunteers and other variables. Unfortunately, we cannot provide transportation to anyone under the age of 18. Older kids are welcome to work in the fields with close parent supervision and with the Farm Manager’s approval. Kids age 16 and older may volunteer on their own without adult supervision. However, a Volunteer Form – Non Member 15-16 must be filled out with a parent/guardian phone number where they may be reached in case of emergency or in the event the child’s behavior is not conducive to working on the farm. My child has to complete “Community Service” hours for school. Can you accommodate them? Yes we have many high school and college students who elect to complete their school service hours at Sweetwater. The age rules (above) still apply. Students must be 16 or older to volunteer on their own. Please note that some of the farm work we do will be at The Children’s Home location off of Memorial Highway so your child must have transportation to get there. Make sure to leave an emergency contact number where you can be reached. If there is paperwork that needs to be signed, we are happy to do that once the volunteer hours are complete each day. Do I need to fill out a volunteer waiver ahead of time? It is very helpful if you are able to do fill out a wavier before you come in. You only have to fill it out once per season. Below are printable versions of the Volunteer Form. Please note one is for CSA members and the other is for non-members. Sweetwater has many groups that join us to volunteer as well. If your work or community group would like to coordinate a day to help out, please Contact Us so we can schedule a time for you. Are there volunteer opportunities that do not involve farming or physical labor? Yes! We have plenty of opps throughout the Season. We have several events during the year where we need help with all sorts of things like setting tables, food prep, serving, ticket tables, parking help, and clean up. On a regular basis we can almost always use help cleaning the common areas of the farm such as the kitchen and bathrooms. We love to have volunteers cook lunch or goodies for our farmers (email us and then bring the food in.) If you are a seasoned member, we can use your help at the CSA table to help newer members. If you have special talents such as photography, painting, sewing, computer work, electrical or construction work, fundraising, teaching, or just love to work with kids… let us know what you can do and we’ll try and work with you. Who do I coordinate my volunteer time with? Most of your questions can be answered by reading through all of the information contained on this web page and most volunteer days you can just “show up” without coordinating with anyone (as long as you arrive by 7:30am). If you still need more info, please feel free to Contact Us so we can direct you. What if I can’t volunteer? Time is short and we understand that not all Members will be able to volunteer the 4 hours per season that we ask for. However, we do count on those 4 hours to help us keep our costs down and our community growing. As an alternative to working the hours, Members may “buy out” of their hours by paying a $30 fee (cash or check accepted). Volunteer fees should be paid to our Farm Manager or Program Director. Or Members may opt to donate a gift card for one of our event raffles or for use at the farm. We prefer local restaurants, health food stores, office supply, local gift stores and local services. (All gift cards should be valued at $25 or more. Please indicate the amount on the card.) Contact us if you are not sure if a particular gift card would be appropriate. How do I stay in the loop on volunteer opportunities? The best way is to sign up for our weekly newsletter. The newsletter provides info on all the upcoming events, important information about the farm, and special volunteer opportunities. You can sign up by entering your email address in the “Join our Mailing List” box on the right side of this page and clicking on the arrow. Or if you don’t wish to sign up, simply bookmark this page of our website and check back with us on a weekly basis for updates. Interested in becoming a Harvest Leader? We also need “Harvest Leaders” who get trained to help lead the harvest on our busy Sunday mornings. If you can volunteer on Sundays on a regular basis (weekly, monthly or whatever you can do), we can train you on our harvesting techniques, so you can teach other volunteers what to do. If you’re interested, just let us know the next time you come in! We have specific projects that come up from time to time that require special skills, materials, or extra time from our volunteers. Sign up for our Volunteer Newsletter to receive updates on volunteer opportunities helping with special projects. Or contact us if you have a special skill or equipment you think might benefit the farm. For more information about volunteering on the farm, please contact our Volunteer Coordinator.